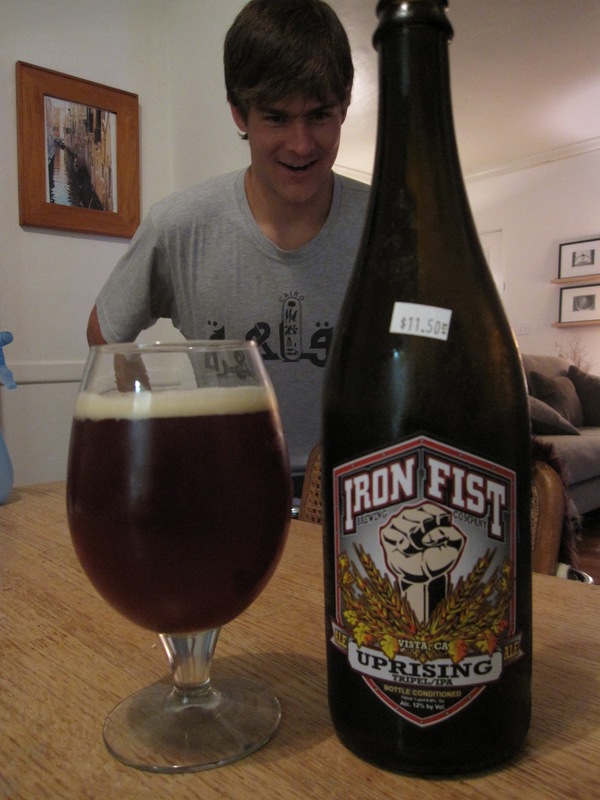 When I saw that Iron Fist was putting together a tripel IPA, I was excited, to say the least. I absolutely love Le Freak (though for some reason it's started to taste a bit metallic of late, in my opinion), the easiest tripel IPA to find in San Diego. And I'm always up for supporting an operation that's as friendly and welcoming as Iron Fist, particularly since they also make good beer. I decided to share this one with Brent (maybe Samer can translate his shirt), because at 12% it's a bit much for a fella to take on alone. This is a hell of a lot darker than I was expecting. As I was pouring it, I was thinking there was no way this could be a tripel. With that color, it's gotta be more of a dubbel, or at this ABV, a quad, right? It doesn't really smell like a dubbel or a quad, though, none of the musty/cardboardy dubbel malt or the alcohol-soaked raisin quality of a quad. It's really fruity with plenty of nice tripely banana and Belgian spice. The hops that make this an IPA are there, but they're hidden a little bit. First impression of the flavor is booze, booze, and booze. Brent said if you're not careful, it burns a bit when you take it down. I'll let you make your own 'that's what she said' joke. Once my palate fought through the alcohol, I was a little confused. This isn't just a tripel, as I'd surmised from the pour. There's tripel flavors, almost wit or hef-like banana and clove plus Belgian spice, but there's also a lot of dark-fruity character. So it seems to me that the Belgian part of this takes its lead more from the strong dark ale style than the tripel style; that's ABV's consistent with that too. As with the nose, the hops are floating around in there and provide a light bitterness, but this isn't one of those west coast IPAs brewed with Belgian yeast (like Cali-Belgique or Le Freak). Well, this wasn't what I was expecting at all, and it doesn't really compare to Le Freak style-wise. So I have no frame of reference. I definitely liked it a lot though; as Brent said, if you're going to get drunk off a 12% beer, there's no better way to do it, and I agree with that wholeheartedly. Purely out of curiosity, I'd be interested to see what would happen if they imperialized it (hop-wise, of course, no need to boost the ABV more), but even as-is I'd have no problems drinking it again.